Ramat Aviv: Israel’s Animal Rights Community is up in arms over credible reports that a chimpanzee housed at Tel Aviv University’s Sackler Faculty of Medicine took its own life early today after a marathon session in which it was forced to read the newspaper Haaretz every day for three weeks straight. The chimp, known as “Dudi” was found in his cage at dawn, unresponsive, and attempts to revive him with coffee and a nice cinnamon pastry failed. The Daily Freier was on the scene as various Animal Rights Activists chained themselves to the Medical School’s gate. Tel Aviv, Bograshov: Tel Aviv University graduate students Melissa P. and Kate D. have adopted “The Right of Return” in their ongoing dispute with a bracelet bar on Bograshov near Ben Yehuda. The women’s ordeal began earlier this evening around 8:30 PM local time when they arrived at the establishment, purchasing the ’79 Shekel Red Bracelets’, allowing an unlimited amount of house wine, draft beer, and mixed drinks. After spending several hours at the establishment getting, as one bystander noted, “hella wasted”, the ladies departed the bar. It is at this point that the narratives of the protagonists in this ordeal diverge, with bar hostess Anat L. claiming that the ladies voluntarily left their seats and set out toward Dizengoff Street, while Melissa and Kate insisting that they were forcibly evicted from their land seats and cast out of the bar “for like no reason”. The Daily Freier spoke with Anat for her perspective on this ongoing tragedy. Daily Frieier Proud to Announce Launch of New Boardgame “BDS Twister”! Today the Daily Freier is proud to announce the launch of its exciting new boardgame, “BDS Twister“! BDS Twister lets committed and self-identified “peace activists” find exciting new ways to square their progressive ideals with their tacit support of regimes under which being gay is illegal but honor killings are no big deal. Daily Freier reporter Harun Kenoğlu covered the product launch today at Ann Arbor’s “People’s Third World Anarchist Food Co-Op” with the details. An equally excited Willow Amoud explained her winning moves. 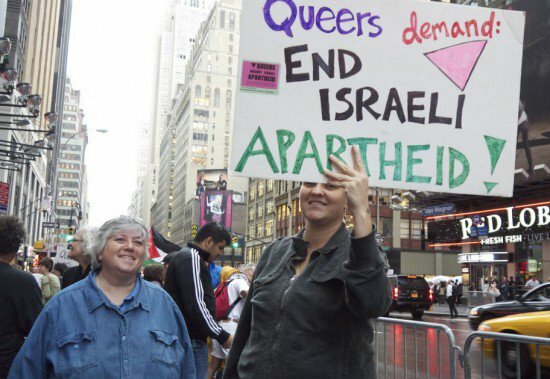 “I landed on ‘Gay Youth flee West Bank for Safety of Tel Aviv’, twisted my torso, popped my elbow, which is easy ‘cuz I’m double jointed, and landed one hand on “Because of the Gaza Blockade”, and the other on “Stop Pinkwashing!” Double points! Daily Freier contacted BDS organizer Omar Barghouti, who was less than thrilled but seemingly unsurprised that a Jewish guy found a way to make a quick buck off of BDS. Concerning recent peace efforts, Mr. Schwartz expressed reservations; “If this current ceasefire holds through the weekend, my entire timetable is thrown off“. When contacted by Daily Freier Staff about Mr. Schwartz’s overtures, “Melissa from Rockland” had no idea in fact who he was.